If you have trouble pushing a button, like the flat pushbuttons on an elevator, superglue a chess piece to it. This can also work with switches or other controls. Basically, any time you need to extend a control or make it easier to grasp or shove. This hack was suggested by some guys from the organization Knowbility who were at my Open Source Disability Tech talk at SXSWi 2009. It sounded like they use this hack fairly often to help people with dexterity issues. It struck me as a beautiful and simple hack, very cheap and easy to execute! 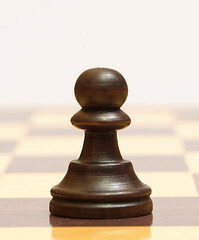 Materials: A chess or other knobby game piece with a flat undersurface; superglue.